The AMPD Group is a dynamic entertainment and hospitality development and management company located in the South Side of Pittsburgh, Pennsylvania. Formed in 2006 by Adam, Michael, & Patrick DeSimone, the group has diverse expertise in real estate, development, finance, and asset management. The partnership has grown its portfolio from 2 locations in 2010 to 8 locations in 2014 with 6 unique concepts in the restaurant, bar, live music, and nightclub categories. 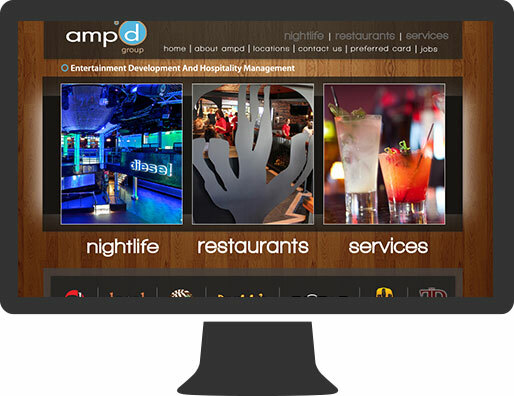 AMPD Group of Pittsburgh was in need of a partner who could design the graphics for marketing and print materials as well as build and manage mobile responsive websites for each of its businesses that could communicate the unique feel and style of each establishment. It was important that each site would be integrated with social media as well have the capabilities to take online reservations for dining and VIP services. CINTACS has been able to provide graphic design and website development services for several projects for the AMPD Group. Each project was designed to fit the venues specific needs as far as style and functionality. Through collaboration on strategic marketing strategies with the AMPD Group, CINTACS has been able to provide a wide array of advertisements varying from graphic design flyers to large format banners backlit window graphics, and more.